Article I of the U.S. Constitution grants all legislative powers to a bicameral Congress: a House of Representatives and a Senate that are the result of a “Great Compromise” seeking to balance the effects of popular majorities with the interests of the states. Our system currently provides for a two-year term of office for House members from the 435 population-based districts. In the Senate, voters of each state elect two Senators, who serve 6-year terms that overlap (such that only one-third of the chamber is up for election in any given election cycle). The two chambers are fundamentally equal in their legislative roles and functions. Only the House can originate revenue legislation, and only the Senate confirms presidential nominations and approves treaties, but the enactment of law always requires both chambers to separately agree to the same bill in the same form before presenting it to the President. Because each chamber has the constitutional authority to make its own rules, the House and Senate have developed some very different ways of processing legislation, perhaps partially flowing from their constitutional differences. In general, House rules and practices allow a numerical majority to process legislation relatively quickly. Senate rules and procedures, on the other hand, favor deliberation over quick action, as they provide significant procedural leverage to individual Senators. Congressional action is typically planned and coordinated by party leaders in each chamber, who have been chosen by members of their own caucus or conference – that is, the group of members in a chamber who share a party affiliation. Majority party leaders in the House have important powers and prerogatives to effectively set the policy agenda and decide which proposals will receive floor consideration. 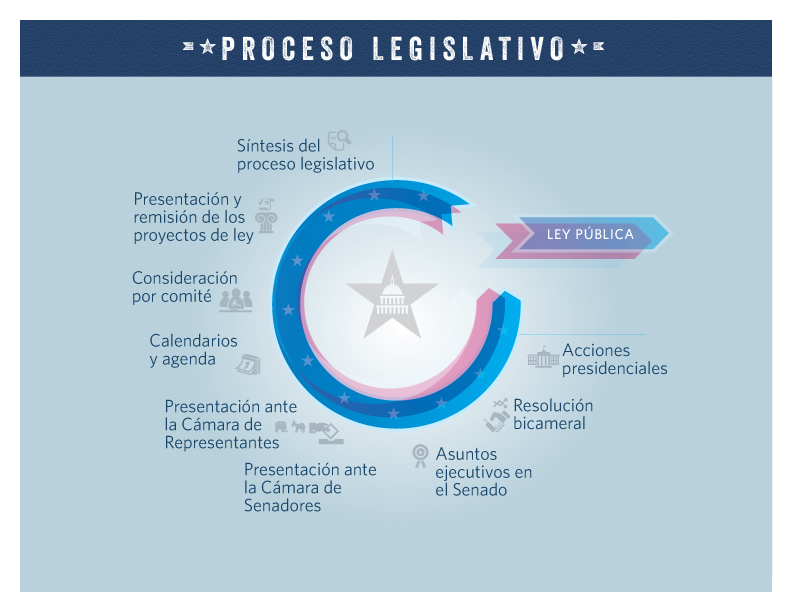 In the Senate, the leader of the majority party is generally expected to propose items for consideration, but formal tools that allow a numerical majority to take action are few. Instead, majority party leadership typically must negotiate with minority party leaders (and often all Senators) to effectively conduct Senate floor action. In both chambers, much of the policy expertise resides in the standing committees – panels of members from both parties that typically take the lead in developing and assessing legislation. Members typically serve on a small number of committees, often for many years, allowing them to become highly knowledgeable in certain policy areas. All committees are chaired by a member of the majority party, though chairs often work closely with the committee’s ranking member, the most senior member of the minority party on the committee. In almost all cases, the ratio of majority party to minority party members on a committee roughly reflects the overall partisan ratio in the congressional chamber. Committee members and staff focus much of their time on drafting and considering legislative proposals, but committees engage in other activities, as well. Once law is enacted, Congress has the prerogative and responsibility to provide oversight of policy implementation, and its committees take the lead in this effort. Both chambers provide their committees with significant powers and latitude for oversight and investigations into questions of public policy and its effects. While the engine of legislative ideas and action is Congress itself, the President has influence in the legislative process, as well. The President recommends an annual budget for federal agencies and often suggests legislation. Perhaps more significantly, the power to veto legislation can affect the content of bills passed by Congress. Since it is quite unusual for law to be enacted over a presidential veto, Congress typically must accommodate the president’s position on proposed policies. The process by which a bill becomes law is rarely predictable and can vary significantly from bill to bill. 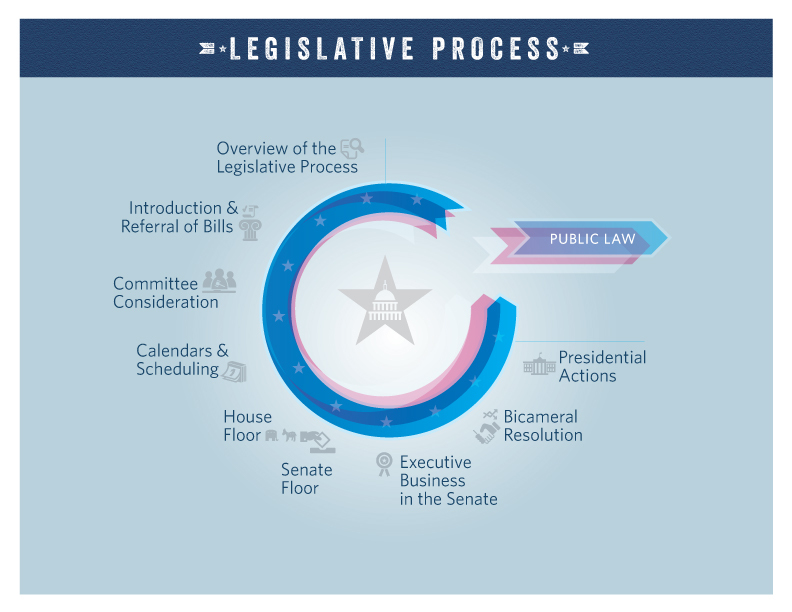 In fact, for many bills, the process will not follow the sequence of congressional stages that are often understood to make up the legislative process. The presentations on specific topics that follow present a more detailed look at each of the common stages through which a bill may move, but keep in mind that complications and variations abound in practice.